Here you will find happy customers and some good ole hen clucking. I love what I do and where I do it! Beautiful quilting at an affordable price. You can order this cute pillow from my Etsy shop. A great gift for anyone on your Christmas list! If you are like most quilters, you love to piece those quilt tops but then faced with the dilemma of how to handle that large quilt in a small home sewing machine. 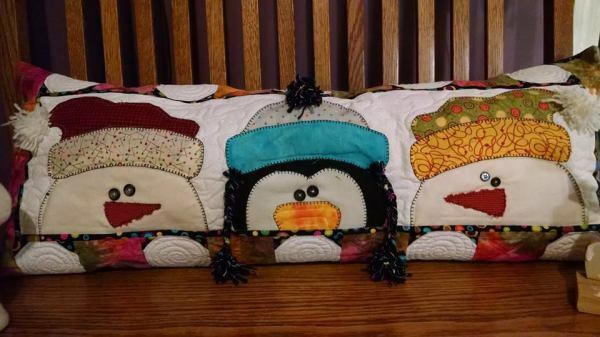 Hand quilting is one option but that is going to take months and you just don't have that kind of time. Machine quilting is a popular option and is more durable than hand quilting. When trying to decide, ask yourself if your quilt is meant to be used, loved and washed a great deal. If it is, I recommend machine quilting. My longarm quilting services are hand guided/freehand quilting on my Gammill Vision 2.0 Longarm Quilting Machine and done in my SMOKE FREE studio. My turn around time is appoximately 4 weeks. If you need your quilt done by a certain date just let me know, often I am able to honor those requests. I realize at times there is a quilt that needs to be done in a short time frame. I do custom and edge to edge quilting. Edge to Edge quilting is stitched from one side of the quilt to the other and does not treat borders as a separate piece. 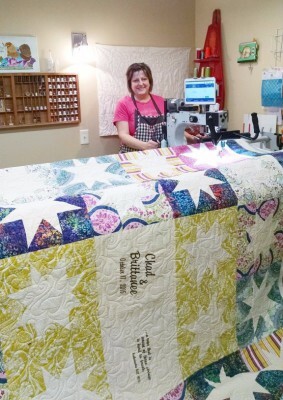 Pantographs are very popular with longarm quilting and give a wonderful quilted look. I have a wide range of beautiful pantographs to choose from. I have discovered with the right choice of thread color and pantograph pattern, I can give you a look of custom without the additional expense. I have longarmed quilts with applique with simple edge to edge patterns combined with custom quilting and they come out beautiful. ​You will find all of my edge to edge quilting patterns here on the website under the edge to edge patterns tab. I offer many choices and price ranges to suite your individual needs. My prices are also listed here on the website as well as the information you should need to prepare your backing fabric, batting choices etc. Feel free to call for an appointment or telephone consultation if you need help or have questions. My order form is downloadable or you may contact me and I'll send it to you. I will need the dimensions of the quilt as all prices are based on actual measurements. I look forward to working with you for your quilting needs. Check out and like me on facebook click on the icon below.